The U.S. Secretary of State John Kerry noted during a February meeting with the Member of the PRC State Council, Yang Jiechi, in Beijing that the U.S. appreciated the constructive role played by China on the Iranian nuclear issue, and that Washington and Beijing had common interests. The chief U.S. diplomat urged the parties to strengthen their practical cooperation and to promote China-U.S. relations of a new type. The question is whether China is ready to cooperate with America in a new way and, in particular, to reconsider the nature of its friendly relations with Iran? We can agree that the Iranian issue has not lost its relevance in China-U.S. relations, however, Beijing, against the wishes of the U.S. Administration, continues to consider its political relations with Tehran as a kind of lever of pressure on Washington. Chinese support for Iran is an important element of the strategic rivalry between the U.S. and China in the Middle East, where China is considering the struggle between Washington and the Islamic Republic as an undisguised desire of the Americans to secure their strategic dominance and gain control over rich hydrocarbon resources of Iran. China, which consumes increasingly greater amounts of the world’s hydrocarbons, is afraid to lose its source of oil and gas from Iran, which is perhaps the only source independent of America in the Middle East. China’s dependence on imported oil exceeds 50%. Moreover, Iran accounts for 11 to 14% of all Chinese oil imports. In addition, Chinese oil companies are involved in six petrochemical projects in Iran, the total value of which is $8.6 billion. The total trade turnover between the two countries amounted to about $36 billion in 2012, while the trade turnover between Iran and China increased by 3.5% in 2013, according to preliminary estimates. Thus, China remains the largest trading partner of Iran. It is also important for Beijing that the Iranian market is not controlled by the United States, and there is no American economic competition in Iran. Beijing’s foreign policy toward Iran is closely linked with its economic interests and energy security, and that is why American expectations of change in Chinese diplomacy in this area can be considered as a desired illusion, with no actual grounds. Nothing suggests the probability of this, at least for now. In the future, China will preserve its foreign policy pragmatism in its relations with Iran. Beijing has several advantages even over Russia in building relations with the Islamic Republic. First, China and Iran have no geographical borders, which fact helps avoid tensions usually occurring between neighboring countries. For example, the question of the legal status of the Caspian Sea in Russian-Iranian relations. Second, China is the biggest buyer of Iranian oil and one of the few importers who continue to cooperate with Iran in conditions of a Western oil embargo. Finally, China, like Russia, is a nuclear power and a permanent member of the UN Security Council, having the right of veto. Iran relies on China, as well as on Russia, as a country preventing the adoption of radical decisions in the Security Council. Tehran believes that China is the only country in Asia that can become a superpower and challenge American power in the foreseeable future. At the same time, the situation around the Iranian nuclear dossier says much less about Chinese interests and motivation than about Russian and Western. Tehran is counting on Chinese assistance in the redistribution of the balance of power in its favor in negotiations on the one hand, and in the neutralization of the efforts of Iran’s enemies in their attempt to derail the ongoing process of closing the nuclear dossier issue by diplomatic agreements on the other hand. 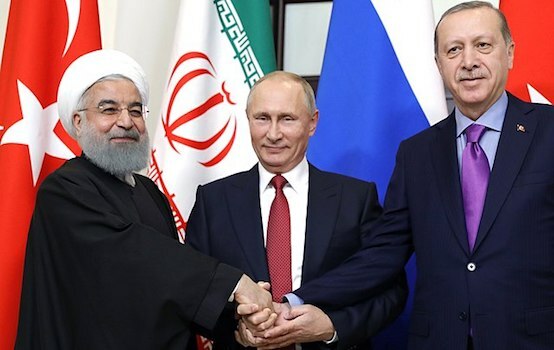 Moscow also considers Beijing as a potential partner in the peaceful settlement of the Iranian nuclear conflict with the United States and the West. It is becoming increasingly apparent to Russia that Iran and even Syria are not the ultimate goals of the U.S.A., with the current situation being the result of efforts aimed at imposing a unilateral Middle East system oriented towards America and the West. In this context, Iran is considered as the main barrier that cannot be overcome by the Americans, while the country preserves its Islamic regime. Reasoning from this fact, both Russia and China will preserve their strategic cooperation on Iran in the foreseeable future, and Moscow is deliberately leaving the economic competition with Beijing on the Iranian market behind the scenes, in favor of big diplomacy. By the way, China is not the most convenient trading partner for Iran, as the Chinese are perfectly able to twist arms and, taking advantage of Iran’s economic difficulties, to wring huge discounts and preferential terms. Nevertheless, on the basis of strategic considerations, Tehran is trading with China at a discount, often being on the break-even point. However, we should not forget that the key sectors of Iran’s economy, i.e., oil, gas and energy, are state-owned. Although there has been some liberalization in this matter, there is no danger for Iran that the control over them will pass to China. In this context, we may note the artificiality of a threat in respect of a probable castling move – with the European Union ousting China from Iran. The Iranian authorities planned the investment needs for oil and gas development in the amount of $86 billion, and China’s share may reach 10–15% of this, which does not create significant obstacles for investors, both from Europe and from Russia. Nevertheless, the dynamics of the trade relations development with Iran clearly demonstrate the advantage of China. Thus, after the Islamic Revolution in Iran, the U.S. trade embargo allowed China gradually to occupy the free space that once belonged to the Western countries. In 1978, the share of Chinese goods in Iranian imports was 1%, American – 21%, German – 19%, Japanese – 16%, and British – 8%. Over the past ten years, there has been a significant growth in trade between the two countries. To date, Iran’s main trading partners are Japan (14% of Iranian exports), China (12.8% of exports and 10.5% of imports), and several European countries: Germany, Italy, and France. China takes a position on Syria that is close to the position of Iran, and it joined the Russian-Iranian efforts to block measures aimed at the removal of Syrian President Bashar al-Assad from office. China has traditionally sought to avoid alienating Iran from the settlement of the conflict in Syria and condemned the U.S. decision to withdraw the invitation to Tehran to participate in the Geneva-2 Conference. Beijing’s foreign policy principles, in respect of Syria, are perfectly in tune with the strategic doctrine of the Islamic Republic, which opposes any foreign military intervention aimed at changing the regime. Both countries are similar in terms of non-recognition of the rights of foreign states or international organizations to interfere in the internal affairs of any state. With regard to the Americans, this is manifested in the mutual opposition to the U.S. claims to respect human rights and to impose Western standards of democratization on China and Iran. Iranian leadership does not accept American support given to Taiwan, and has no relationship with the Dalai Lama XIV, being disgraced in China, considering this question a purely internal affair of China. 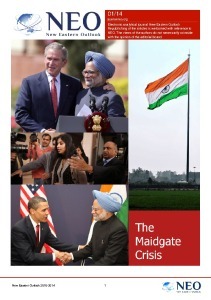 In general, both countries seek to avoid any cause for aggravation of political relations. In conclusion, we should note that Iran’s deepening relations with China means the acquisition of an ally in the group of leaders in contemporary international relations, and attraction of investments that are badly needed for the development of Iran’s economy in the conditions of Western sanctions against Iran’s economy. Due to the unresolved crisis around the nuclear issue, and the proximity of the two countries’ positions on Syria, Iran-China cooperation will preserve its nature as a strategic partnership, and will remain an element of rivalry between China and the U.S.A. in the Middle East. Nikolay Bobkin, senior research fellow at the Center for Political and Military Studies, Institute for US and Canadian Studies at RAS, PhD in Military Sciences, Associate Professor, exclusively for the online magazine New Eastern Outlook.